I fear this won’t be the first time I indulge in an overpriced and GORGEOUS notebook to write in. Designed in Montreal, Made in Italy, Purchased in Adelaide. Lovingly used in Calgary. A perfect round the world trip. It’s leather and has inpiring words embossed on its cover in various languages. Could it be more beautiful? I’m terrified to soil its pages! I LOVE your note book!!!!! At last, someone else with a love of beautiful note books, I thought I was alone. I have to resist the temptation of buying more, as I have at least 5 I just cannot use; as you said ‘I’m terrified to soil’ the pages! I’ve filled the first page!! So liberating! I envy you! If I attempt to, I never know what to write. 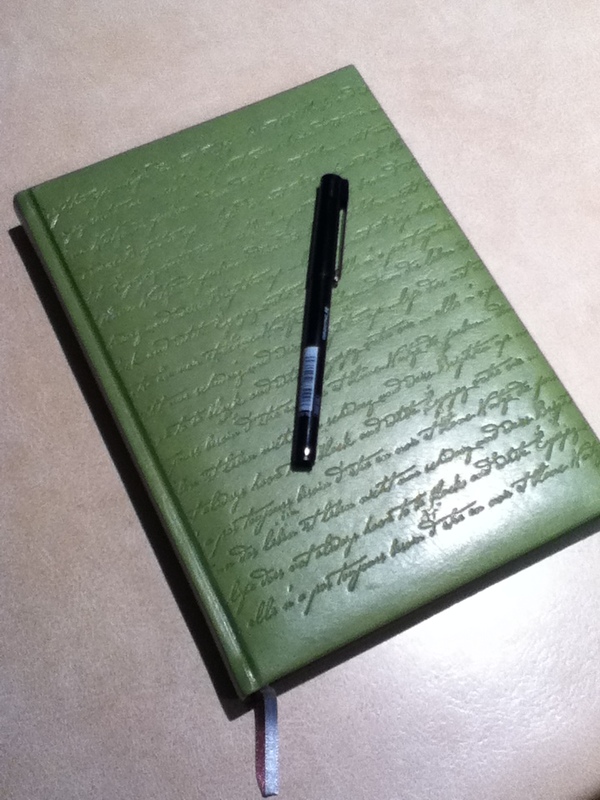 I thought of a journal, well, more like a book filled with positive things that have happened throughout the day. So far, it just doesn’t feel right!